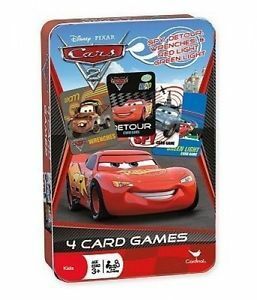 Disney Pixar Cars 4-Card Games in Tin Box Just $3.99! Down From $17! You are here: Home / Great Deals / Disney Pixar Cars 4-Card Games in Tin Box Just $3.99! Down From $17! Sears has this Disney Pixar Cars 4-Card Games in Tin Box on sale for just $3.99 (Reg. $17)! Card Games in Tin Box: Disney Cars Collection . Supercharge your fun with these exciting Cars 2 card games! Wrenches, Spy, Detour and Red Light Green Light!